William Albright (1791-1856) lived in Chatham County and was a landowner, slave-owner, merchant and state senator. Thomas Dixon (d. 1899) owned the Dixon Manufacturing Company in Snow Camp, North Carolina. He married William Albright's daughter Eleanor and they had three daughters.Papers include correspondence, various receipts and invoices, newspaper clippings and other items concerning the temperance and prohibition movements, advertisements for Snow Camp Woolen Mills, and miscellaneous papers. William Albright (1791-1856) lived in Chatham County and was a landowner, slave-owner, merchant and state senator. Thomas Dixon (d. 1899) owned the Dixon Manufacturing Company in Snow Camp, North Carolina. He married William Albright's daughter Eleanor and they had three daughters. Papers include correspondence, various receipts and invoices, newspaper clippings and other items concerning the temperance and prohibition movements, advertisements for Snow Camp Woolen Mills, and miscellaneous papers. Additions to the abstract, biographical note and collection overview by Ashley Yandle, May, 2006. William Albright (1791-1856) was born in Alamance County, the son of George and Catherine Holt Albright. He married Louisa Wood and they had eleven children, Elizabeth, Julia, Margaret, Tamer, Durant Hatch, William Gaston, Eleanor, Mary Emily, Martha and Henry Clay Albright. William lived in Chatham County, owned 3,000-4,000 acres of land, and had numerous slaves. He was a merchant and active in public affairs. The first public meeting to promote railroads in North Carolina was held at his home in 1828. William Albright served in the North Carolina State Senate from 1836-1848 and 1852. Thomas Dixon (d. 1899) owned the Dixon Manufacturing Company in Snow Camp, North Carolina. He married Eleanor Albright and they had three daughters, Flora, Eula, and Florence. [Identification of item], PC 58, Albright-Dixon Papers, State Archives of North Carolina, Raleigh, NC, USA. Gift of Miss Florence Dixon of Guilford College, North Carolina, July 10, 1939. 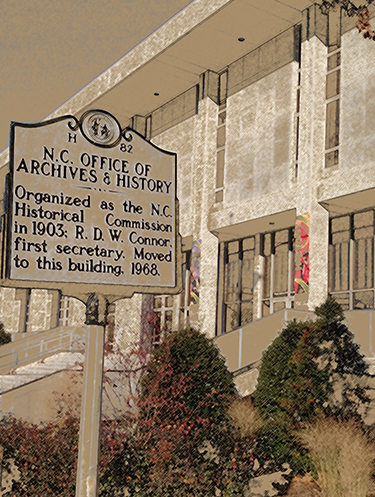 State Archives of North Carolina: Alamance County Will Book 3, p. 263 - will of Thomas Dixon. North Carolina State Library: Albright, Claribel, Some Records of the Albright Family, St. Joseph, Missouri, 1941. The papers include correspondence; various receipts and invoices; newspaper clippings; advertisements; and miscellaneous papers. Several family members were active in the temperance and prohibition movements. William Albright participated in the founding of the Pleasant Hill Temperance Society and the papers include newspaper clippings and other items related to the society. There are also a newspaper clipping of a speech by Eula Dixon as president of the North Carolina Women's Christian Temperance Union, two petitions for prohibition, the commission of W. M. Johnson in the Haw River Division of the Sons of Temperance, and related materials. Various receipts and invoices of William Albright and others (1812-1848), including a bill of sale for a slave, are also part of the collection. The correspondence is mainly letters received by William Albright from individuals like John Shofner, Sarah and Hannah Dixon, John Long, and D. Hickman (written from Camp Branch in 1862). Other items include advertisements for Snow Camp Woolen Mills (Dixon Mfg. Co.), 1890 and ca. 1900-1909, and other miscellaneous papers. The papers include correspondence; various receipts and invoices; newspaper clippings and other items concerning the temperance and prohibition movements; advertisements; and miscellaneous papers. William Albright owned the largest distillery in the Chatham, Alamance, and Orange county area until 1832 when he became interested in the temperance movement. He dismantled his distillery and participated in the founding of the Pleasant Hill Temperance Society. Newspaper clippings commemorating the 75th, 100th, and 101st anniversaries of the society, a program of the 101st anniversary meeting, and an invitation to the 75th annual meeting with the calling card of Miss Eula Dixon, president of the Pleasant Hill Temperance Society, attached, are included in this collection. Eula Dixon was a daughter of Thomas Dixon and Eleanor Albright Dixon. A newspaper clipping of an address by Eula Dixon as president of the North Carolina Women's Christian Temperance Union is also included in the collection. Other items on this subject are an undated petition for prohibition, a printed 1881 petition for prohibition, the commission of W. M. Johnson, the husband of Mary Albright, as a Deputy Grand Worthy Patriarch of the Haw River Division of the Sons of Temperance, and "A Temperance Alphabet". Various receipts and invoices of William Albright and others, 1812-1848, a bill of sale for a slave, and judgments against two Orange County men for non-attendance at militia muster, 1812-1813, are also included in the collection. Miscellaneous papers include an 1843 contract with a Susan Hubbard to teach a common English school, a political circular of Abraham Rencher, 1839, a 19th century mining permit, a poem on The States of a Woman's Life, and the appointment of W. Albright as an agent for Thomas Carter's patent medicines, 1855.